Home Dead Mine Dead Mine Review event HBO horror horror flick horror movie Movie Premiere Movie Review Premiere Night suspense movie 'Dead Mine' Palpitates My Senses with It's Deadly Twist! 'Dead Mine' Palpitates My Senses with It's Deadly Twist! For the second time now, I was invited by my blogger friend Kuya Ferdz of TaDi ("Tatak Digitista") to watch and scream for the premiere nights of two Hollywood movies brought to us by the SM Cinema Exclusives or CinExlusive. Well, the movies we watched together with my officemate friend were truly inline with the Halloween season - they were both terrifying which awaken our senses! Let me share with you my frightening experience watching this second horror movie (I'll share the first one in my next post). 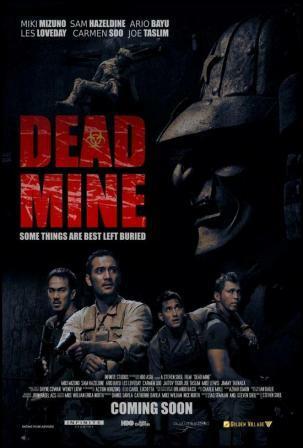 "Dead Mine" is actually the first original feature produced by HBO Asia and making its cinema debut this coming November 9, 2012. There are many good things to note about this movie aside from the breath-taking thriller it offers. Let me count it to you one by one. First, I like how the casts were put together. Yeah, the actors portraying different roles in the movie actually came from different part of the world. Hunks Sam Hazeldine and Les Loveday of Great Britain, cult action star Miki Mizuno of Japan, cutie heartthrob Jimmy T of Singapore, tough hunky dudes Ario Bayu, Bang Tigor, Joe Taslim and Mike Lewis of Indonesia, and our very own sweetheart Carmen Soo of Malaysia comprise the main cast members! 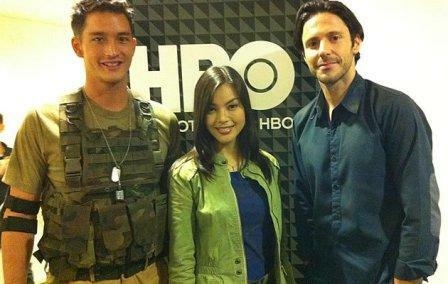 It's nice to see Ms. Carmen Soo who once became part of the Philippine showbiz (particularly in the teleserye "Kahit Isang Saglit" with Jericho Rosales) back in the movie scene via an anticipating Hollywood movie like this. 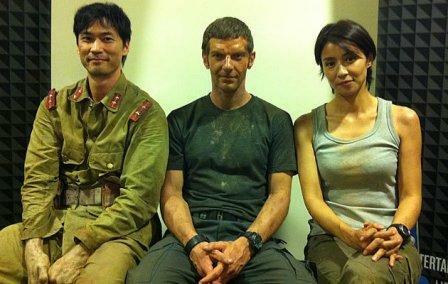 Mike Lewis, Carmen Soo and Les Loveday All Face Death in a Tragic Way! The second good thing about this movie is that it makes you proud about our country. Count how many times the words "Philippines" and "Yamashita" mentioned in the movie! Yamashita or Yamashita treasure is actually part of the Philippine History as it depicts the Japanese invasion in the country forming one of the most important blocks of Filipino history! Conflicts in the movie started as the group of Les Loveday hunts the Yamashita treasure in Bali, Indonesia! Third, the story is unpredictable! We all know that the lead stars of the different movies stay alive until the end. But after you witnessed the ending of this movie, you will get shock on how it was concluded! Fourth, this movie is actually the second film (next to "The Healing") which truly puts me on the state of shock! In the middle of the movie, my heart was beating faster and faster! My 'kaba' was raised to its highest point when the lead stars were hunted by the dead soldiers or when the evil monsters kill the cast! The Good Soldiers were Yet to Defeat! The Dead Soldiers of the Dark! Fifth, the movie didn't only combined action and horror. It also merged the past and the future! Yes, the movie has a touch of historical facts but at the same time presented in futuristic approach. Imagine how the metal immortal soldiers and the oldies who retain youthful and active via experimental formula formed through a hi-tech futuristic approach! Actually while watching this movie, I visualize it as a "Walking Dead" three times higher! The monsters and the evil metal soldiers in this movie were the hi-tech versions of the TV series zombies! Cool.